Bringing a dish to your next get-together? Recipes with biscuits can help take shareable side and appetizers up a notch. For your next potluck, bring along our Skillet Queso Dip with Taco Biscuit Bombs. It preps in just 30 minutes and serves up to 16 happy people. Plus, you won’t have to buy any chips for dipping—that’s what the cheese-filled biscuits surrounding the queso are for. Biscuits can also be a part of your family dinners, whether you serve it as a side or use it as a starter for an entrée, like our Chili Cheese Dog Biscuit Cups. Or, try finishing a dish with a flaky biscuit topping, like our Biscuit-Topped Cowboy Casserole. Warm, flaky, buttery biscuits can also put a twist on classic dishes you already know and make them better. Take pot pie, for example. Instead of spending time meticulously making a pie crust by hand, you can make a skillet pot pie and top with biscuits. You can even put a delicious spin on already-tasty biscuits and gravy and turn it into a casserole. 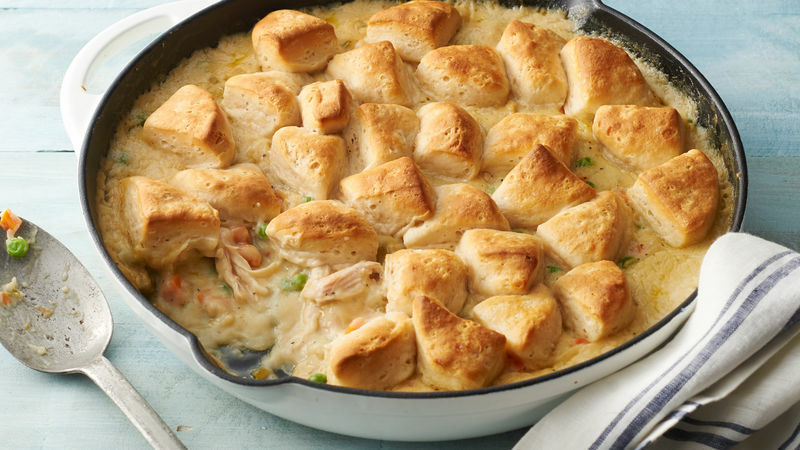 However you decide to use Pillsbury biscuits, one thing is clear: you are just one can of from the best biscuit recipes ever.